Part 1 of this article can be seen here. Traditionally, the rail head at Wiener Linien was ground as a five-sided polygon (see Figure 1). This approach has some negative impact on wheel wear, especially in the area of the flange root (see the red-ringed area in Figure 2.) While it is not possible to machine rail heads true to their profile, with genuine head radii — the current grinding machines leave a sharp-edged polygon on the rail head, in most cases — a condition-based grinding program can reduce the number of edges generated in grinding. Wiener Linien found that it can produce higher-precision polygons (with a greater number of edges) by means of more frequent grinding operations with a lower rate of cut. 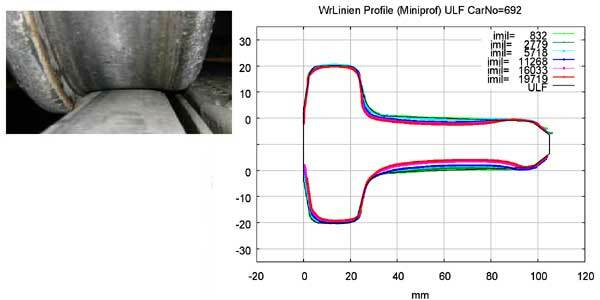 Wiener Linien also has learned to avoid any “bluing” or “heat tints” (unintentional hardening of rail steel caused by excessive heat generated by too intensive grinding operations), which can have a negative impact on the wheel profiles. The “track dynamics” portion of the “profile optimization” program, along with the accompanying long-term studies of rail and wheel profile wear patterns, helped to identify target profiles (based on an adaptation of the Vignole rail profile) and possible changes to grooved rail profiles. Track components, such as crossing frogs, can be damaged by the “false flanges” of worn tires. Wiener Linien has also begun challenging some of the assumptions that govern track design. Should, for example, the running edge radii of grooved rails be enlarged? The current radii ratio of 10 mm in the tire groove versus roughly 9 mm at the running edge of the grooved rail is very unfavorable. In mathematical terms, this results in an almost infinite equivalent conicity and, thus, unstable running behavior. Visual inspection and wear data obtained through periodic profile measurement have shown that wear in the tire groove and rail head radius tends to create a sharp edge on both components, i.e. the radius of the flange groove and of the rail head become successively smaller. This would not deserve much attention, were it not for wheel re-profiling and its requirements. Experience has shown that the minimal gauge clearance in both tramway and metro operations is unfavorable in terms of wear behavior and riding stability. A small gauge clearance in new rolling stock on new track will result in high initial wear, especially at the flange faces. This is why considerations have been made to match the geometry of wheelset and track. Regular inspection of wheels ensures that the tires can be re-profiled as needed in order to control wheel tread hollowing and false flange contact. On the rail side, the next step toward a proper grinding strategy is to have a precise knowledge of the longitudinal profile of the rail. (The transverse profile is not very indicative of ride stability and wear behavior.) Surface irregularities (short, medium and long wavelength corrugations, surface defects and material flaws such as head checks, squats, cracks or crushed areas) impact rail (and wheel) wear and vehicle / track performance. Surface irregularities also generate high dynamic loads, which are noticeable in the form of structure- and air-borne noise, and reduced passenger comfort. Wiener Linien began to perform a manual survey of the rail surface using an electronic measurement system called the “1 m straight edge.” It found, however, that the data was not reproducible, as the system could not accurately identify the precise locations at which pre- and post-grind measurements were obtained. Manual gauges were augmented by visual inspection of the rails, especially the grooved rails, in order to better assess rail conditions. While the ability of inspectors to judge rail conditions improved, their assessments were difficult to incorporate into a systematic database. This led Wiener Linien in 2007 to begin measuring the entire metro network and parts of the tramway network with measurement cars. Through the use of this equipment, Wiener Linien identified that short-pitch corrugations posed minor problems for metro and tramway service, whereas medium-wavelength corrugations had a much greater effect on dynamic loads and deviations from the design track position. It also identified the need to focus its maintenance activities on rail joints and crossing frogs. Based on these measurements, rail hardness measurements and preliminary information from an alternative eddy current-based measurement system, Wiener Linien, in association with Dr. Stuart Grassie of RailMeasurement Ltd., prepared a tender document for the implementation and review of rail grinding programs. Wiener Linien has catalogued the rail, wheel and vehicle / track interaction-related problems it identified to develop a “surface and transverse profile strategy.” The key aspect of the strategy is that there is no universal solution or universally applicable method of rail grinding. Each segment of the system must be looked at independently. The U3 metro line, for example, has geometry defects that stem from the original design. There are long sections with tight gauge along the line. 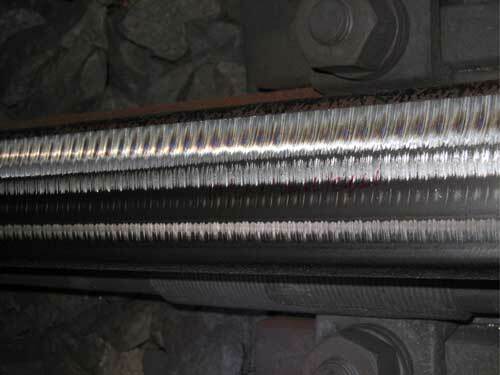 While the head-hardened (HSH) rail used in curves of up to 1,500 m on the line has favorable wear properties, the rail must be ground regularly to prevent brittle cracks and other surface anomalies. Experience has shown that rail on tangent track and very large radius curves on the U3 line must be regularly ground and re-profiled to avoid two-point contact and ensure uniform contact on the running band in the center of the rail. Areas with tight gauge must be ground to provide a more favorable gauge clearance. Curves of up to 300 m must be asymmetrically ground to generate “pure” rolling motion (see Figure 6). Tangent and curved track must be regularly ground to keep the rail free of corrugation and surface defects. The plan for tramways is to re-profile the running edges for radii of up to 12 mm in tangent track in order to ensure a uniformly spread rolling motion and reduce the surface pressure at the running edge. This will also help reduce material flow toward the outside of the rail. While the findings for curved track are not yet complete, the goal is to enable vehicles with independently rotating wheels to negotiate without the need for any gauge widening in curves. Wiener Linien will conduct a pilot program to test its findings and change to the desired target profiles on the U3 line during the fourth quarter of 2007. The results of the pilot test will be incorporated into the tender document for future rail grinding programs on the entire metro system. This, along with the ongoing analysis of the performance of independently rotating wheels in tramway service, will enable Wiener Linien to establish specifications for rail profile grinding services for the metro and tramway systems. Effective management of these programs, together with the ongoing automation of decision-making in mechanized track maintenance, will complete the changeover to electronic automated condition monitoring for all aspects of vehicle and track maintenance. The use of automated tools, including an LCC/RAMS-based maintenance strategy to determine component life-cycle costs, will enable Wiener Linien to evaluate its maintenance strategy at any time. This, in turn, will allow managers to better monitor efficiency, control costs, and manage wheel / rail interaction. Edgar Fischmeister, Dipl.-Ing, is Head of the Track Maintenance and Construction Department, Wiener Linien; Markus Ossberger, Dipl.-Ing. Dr., is former Maintenance Process Manager for Light Rail Systems, now Department of Construction and Subway-Planning, Wiener Linien; Paul Mittermayr, Dipl.-Ing. Dr., is Director of BAMM, research consultant to Wiener Linien and the Austrian Federal Railways (ÖBB); Roman Pongracz, Dipl.-Ing, is a former Manager of Wiener Linien, and Vehicle Consultant. Grassie, S., Kalousek, J., “Rail Corrugation: Causes and Cures,” International Railway Journal http://findarticles.com/p/articles/mi_m0BQQ , July 2000http://findarticles.com/p/articles/mi_m0BQQ/is_7_40 . Iwnicki, S. (Ed. ), Handbook of Railway Vehicle Dynamics, Boca Raton London New York: CRC Taylor & Francis 2006. Schoech, W., “The European Approach to Quality Control in Rail Grinding,”Interface – The Journal of Wheel/Rail Interaction, August 2004. TCRP Transit Cooperative Research Program, Report 57: Track Design Handbook for Light Rail Transit. Transportation Research Board, National Research Coun–cil. Washington, D.C., National Academy Press 2000. 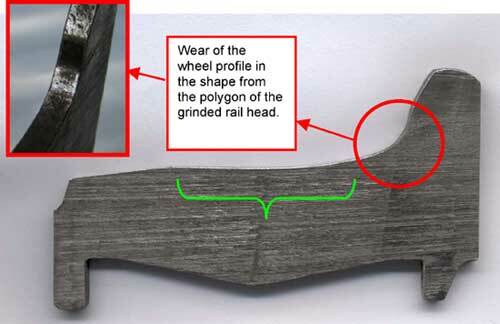 Tuzik, B., “Specialized Rail Profile Grinding on MBTA,” Interface – The Journal of Wheel/Rail Interaction, April 2005. Zarembski, A., The Art and Science of Rail Grinding. Omaha, NE, Simmons-Boardman Books, Inc., 2005.